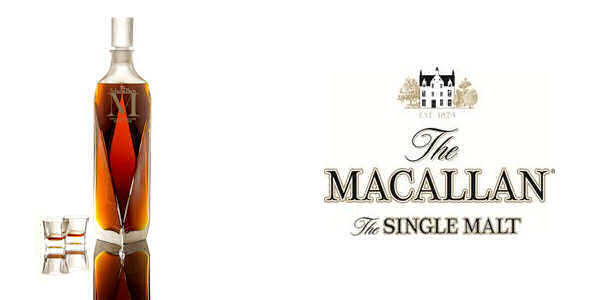 Guinness World Records™ has awarded The Macallan the accolade of ‘most expensive whisky sold at auction’. Now the definitive world record holder, The Macallan M Imperiale 6-litre Lalique decanter sold at auction in Hong Kong for $628,000 in January 2014, breaking the previous record of $460,000 held by The Macallan in Lalique Cire Perdue, raising funds for a host of locally based charities. Lalique created four of these stupendous decanters for The Macallan. Each decanter required the work of 17 craftsmen, including two with the prestigious title, “Meilleur Ouvrier de France”, with each taking over 50 hours to complete. Of the four, two have been archived by The Macallan and one has been committed to a private collector in Asia. The fourth, Constantine (named, as are the other three, after Roman emperors), is the only one to feature the engraved autographs of the three principal creators – Lalique/Silvio Denz, Fabien Baron and Bob Dalgarno. Constantine was presented at an auction of Finest and Rarest Wines and The Macallan by Sotheby’s, in Hong Kong, on Saturday, 18 January 2014. The Macallan is one of the world’s most sought after and collectable whiskies, consistently number one in value at auction among all whiskies. All net sale proceeds have been donated to local charities in Hong Kong.